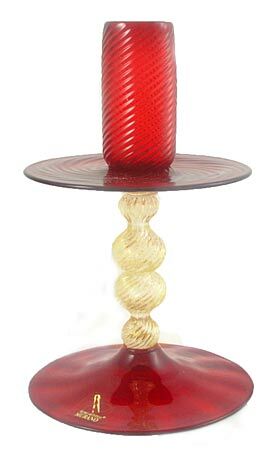 Handmade Murano glass Candlestick featuring 24kt gold foil and a beautiful red Murano glass. Handmade in the furnaces of Murano. This candlestick measures approximately 3.5 inches in diameter and about 8 inches tall. Also available in Crystal/Gold.